The venue for the 2014 Summer Graduate School "Symmetries and Fundamental Interactions" will be the Frauenwörth Abbey near the Bavarian Alps. The participants will be focusing on subjects such as the physics of the Higgs particle and the search for "New Physics," and the corresponding unifying theory that will greatly expand our understanding of elementary particles and fundamental forces. 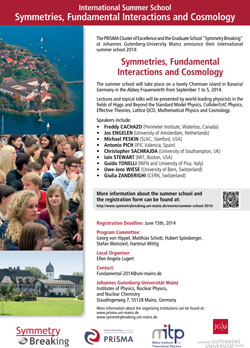 The summer school is being organized by the DFG-funded Research Training Group 1581 "Symmetry Breaking in Fundamental Interactions," the Cluster of Excellence "Precision Physics, Fundamental Interactions and Structure of Matter" (PRISMA), and the Mainz Institute for Theoretical Physics (MITP) at Johannes Gutenberg University Mainz. From September 1 to 5, some 80 participants from Mainz and other institutions in Germany and Europe will come together to discuss the current status of experimental and theoretical fundamental physics with lecturers and internationally eminent researchers. "Our Master's degree students and doctoral candidates benefit from excellent research conditions and the superb support offered at Mainz University and the participating institutions," said the coordinator of the research training group, Professor Stefan Weinzierl. "The research infrastructure at Mainz University, which has its own electron accelerator and neutron reactor, is unique to the research landscape in Germany. Thanks to the extent with which scientists from Mainz are integrated in the multinational, large-scale experiments in the areas of hadron, particle, and astro-particle physics, we have the opportunity to work in the forefront on the key issues facing modern physics." Outstanding research groups and the Mainz Insitute for Theoretical Physics also contribute to providing structured training in the fields of experimental and theoretical physics.